In 2009, the ASAE (American Society of Association Executives), the "association of associations," released a report indicating Washington, D.C., was home to more than 4,500 registered nonprofit trade associations or professional societies. That total ranked third behind only Texas and California, making the District a densely populated playground for organizations such as AMIA, which has more than 5,000 members that call it their professional home. For organizations such as AMIA, Congress is an attractive reason to set up shop in the Washington, D.C., metro area. In AMIA's case, the allure has more to do with the executive branch than the legislative. The organization's interests have focused historically on the National Institutes of Health and the National Library of Medicine. Over time, AMIA membership has grown more diverse and the interests of its members have branched out to include programs supported or regulated by the FDA, Centers for Disease Control and Prevention, National Science Foundation, Agency for Healthcare Research and Quality, Centers for Medicare & Medicaid Services, and other wings of the Department of Health and Human Services. Being in a highly regulated industry, health care associations make up a sizeable portion of the 4,500 associations in Washington, D.C., representing specialty physicians, nurses, long term care, and those fighting diseases of all kinds. However, if the focus is narrowed to only those associations that live at the intersection of clinical research or health care delivery and technology, the list dwindles to a few dozen. Even then, it can be difficult for government officials to understand the value of an organization's members and the various ways they can help them with complex policymaking. The philosophy of AMIA's engagement with the federal government is simple: to improve the legislative and regulatory environment for health informatics research, practice, and education through member expertise. But converting that philosophy into concrete examples and explaining informatics to the uninitiated is easier said than done. Informatics is a nebulous concept for most congressional aids, and even for the more-attuned federal officials. Many AMIA members like to say they work to heal health care with data, information, and discovery. This healing can take on many forms. For example, members who work in health care delivery are pioneers of EHRs and clinical decision support. AMIA members who work in clinical or translational research heal health care by identifying new treatments and taking new cures from the bench to the bedside. Other members close the feedback loop on treatments and help warn providers of potential public health threats. Still other members teach the next generation of informatics experts by developing masters and doctoral programs at leading universities across the country. In total, these members represent a tremendous brain trust for policymakers to help generate evidence-based recommendations on how to use information and communication technologies to improve health and health care. It's an interesting time for the health informatics field and how it interacts with the federal government. The 2009 stimulus funding resulted in an estimated $30 billion entering the health care IT economy, with an EHR in nearly every hospital and approximately three-fourths of private practices. This represents a significant shift over the last five years—and not just in how informatics is leveraged to deliver care. The $30 billion has been joined by thousands of pages in the Federal Register dedicated to health informatics-related policies and regulations. These shifts mean government will play a significant role in the adoption and use of informatics tools for the foreseeable future. The question then becomes, how should knowledgeable experts work to inform and improve public policy and help the government achieve balance in maintaining safety and fostering innovation? For the last 10 years, AMIA has hosted a yearly conference where roughly 100 experts representing the organization's various membership domains gather in Washington, D.C., AMIA's Health Policy Invitational has sought to cultivate timely recommendations for both issues du jour as well as long-standing policy challenges. Topics have ranged from secondary use of data and clinical documentation to consumer health and personalized medicine. Given the heft of the participants, recommendations derived from these conferences add to the corpus of knowledge used by think tanks, policymakers, and other associations. The 2015 topic stemmed from the "Report of the AMIA EHR 2020 Task Force on the Status and Future Direction of EHRs," an effort commissioned by AMIA's board of directors. The report, which identified near-term, concrete recommendations for Washington policymakers, was used as the rubric for a series of Senate hearings held over the summer and included testimony from lead author and current AMIA Board Chair Thomas H. Payne, MD. Subsequently, major legislation being considered by the Senate Health, Education, Labor and Pensions Committee includes numerous concepts related to many of these recommendations. Despite this recent success, reports and long-form policy recommendations are a dime a dozen in Washington, even those focused on AMIA's narrow sliver of health policy. In order to cultivate a reputation as a trusted source of evidence-driven policy recommendations, AMIA strives to be active, timely, and relevant. Every month, dozens of rules are proposed or finalized; agencies field "requests for comment," and town hall-style listening sessions are organized. To have influence, an association must engage in as many of these opportunities as possible, leveraging the expertise of its members. These efforts often result in tangible answers to policy questions the government is looking to implement in the near term. AMIA's most recent work has focused on answering questions such as, "How should the government treat biospecimens and enable secondary research in an age of genomics and cloud computing?," "What informatics tools should providers be required to use in Alternative Payment Models?," and, "Will forcing developers to recertify systems for new clinical quality measures improve the ability to determine quality?" 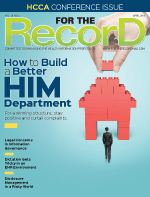 Looking ahead, the industry must deal with how to handle its own success with EHR adoption. With high adoption rates comes the challenge of achieving interoperability among and beyond those systems, the uncertainty of Internet-based applications and application programming interfaces, and questions about how to protect patient data in this emerging landscape. It also must recognize and address that EHRs, through poor usability and uninformed or underresourced implementation approaches, may negatively impact patient safety, essentially undermining one of the primary purposes of modernizing health care delivery. The objective must be to make patients first-order participants in their care by enabling them to have access to their data when and how they want them, even if that means a full extract of their data in a computable format. In terms of research, health care is about to undergo a dot.com-era gold rush the likes of which have not been seen in decades. The Precision Medicine Initiative, the National Cancer Moonshot project, and near-universal political agreement that more funding is needed for basic research will create opportunities for new discovery and necessities to translate those findings into usable treatments. The additional resources also will mean that research waste—the inability to duplicate results, unreported/unpublished studies, and the poor data-sharing plans that have been dogging research as of late—must be addressed. Furthermore, the industry will need to ensure large-scale, high-throughput computing is coordinated across various federal programs, from both a technical and a strategic standpoint. Creating large, incompatible research networks cannot be the outcome of publicly funded data systems. Across the legislative and regulatory landscape, AMIA is well positioned to be a source for evidence-based, data-driven recommendations steeped in the scientific method. By working alongside other associations and stakeholder groups, the organization can help the government craft policies that will enable informatics to achieve its promise to heal health care. — Jeffery Smith is vice president of public policy for AMIA and holds a master's degree in public policy from the University of Maryland, College Park.